About 2 weeks ago, my husband and I hit several Goodwills hunting for booth treasures. It seems as though you either have really good luck or you have really bad luck. This was a good trip, we found lots of fun treasures! If you notice the urn in the picture above, it is featured in my fireplace mantel redo post. Remember these treasure were suppose to be for the booth, but it never made it there. The chair almost didn't make it. I didn't do a thing to it. I loved the red paint and it was naturally distressed in all the right places. Of course it hasn't sold yet, so it could find its way back to my house. I need it like a hole in my head, but it's so cute! The picnic basket didn't make it either! The basket is a Redmon from Peru, IN. Reminds me of the basket from the Wizard of Oz (my favorite movie ever) that Miss Gulch put Toto in. Fell in love with this! Have no place for it, but kept it anyway...what are the chances of finding another one like it and in as good of condition? Who and what was I shopping for again? This hobby/ wanna-be job can be very hard at times. A cute antique serving tray! I'm a sucker for silver and this little basket has a removable divider. Just needs a little polishing and it would make the cutest cracker basket! Fun little brass bird! Plan to paint him! Love the chair...HATE the plaid! My fingers hurt already thinking about pulling all those tacks! And I saved the best for last! My husband found this very unique dresser on a trip to the GW on his lunch hour. I am in love with this piece....can't wait to refinish it! Isn't that just the coolest! The top drawer folds out into a writing desk! We found this cute little table for $3.00 at our neighborhood garage sale the same weekend we went to the GW! We also found another table, but I didn't take a picture of it yet. I will post that one a little later. Now off to the garage to get going on some projects! I decided after Christmas it was time to give my fireplace mantel a face lift. After all...it had been like this for almost 6 years! I hadn't actually decided what I wanted to do, so it sat with the mirror, the 4 candlesticks and a picture of my daughter for almost 4 months waiting for some inspiration! I liked the before (seen below), but was tired of it. Now for all of you that change these things out frequently....cut me some slack, I have a 2 year old and I am doing good to keep this room clean. I must admit...it doesn't look this nice anymore. In fact the corner you where you see the plant...it's full of toys now (you won't get to see this chaos). My husband was with me before Christmas at JoAnn's and really liked the giant paper mache' letters. He wanted one of these for the mantel. I liked the idea, but hadn't been to moved on how to paint it out. Then I ran across a blog with these covered in moss. Fabulous! I showed it to my husband and he was hooked. I can not for the life of me remember which blog I saw this on and I feel really bad because I would love to give them credit. However, Miss Mustard Seed did a tutorial for HGTV. I did mine a little different than she did. So last weekend we finally bought the supplies and I made a date with my glue gun. I purchased moss in a sheet form. It was 18" x 48". Basically, I wrapped the "B" like a package with the moss. I would have taken pics, but I never intended to post this. I was just so excited at how the mantel looked, I decided to share anyway. If you have questions on what I did...you can post a comment and I can get back to you via email this way. I reused the original candlesticks, but painted and distressed them. The mirror stayed the same (I worked too hard the first time to get it to look like that). I used the left over moss on the ball in the urn (this was suppose to go to the booth, but never made it). I love the change! Now....hopefully I will update this a little sooner than 6 years from now ;-) Thanks for looking! Let me preface this by saying....this is not my normal post, but I am so passionate about this, I had to post it! Thanks for enduring! This morning I had to stop and pick up fresh fruit from the grocery for the office. As I was walking in, I passed a table full of marked down Easter items. On this table were 2 boxes of Russell Stover's Easter candy, which included one of my VERY FAVORITE, candies of all times. There is a GOD...Coconut Nest at 50% off and there were 9 of them. I bought every one! And continued to dig to make sure I had ALL of them. These little delights are a very fond childhood memory for me. Every year, I would find several of these little delectable delights in my Easter Basket (Thank you MOM!) Well....I am a little older now and I no longer get an Easter basket, but I usually will buy myself at least one of these around this time of year. This year....I got 9, and not only did I get 9, but I got 9 at 50% off! Did I mention I got 9 of them? Enough to last at least almost a week! I was SO excited! I continued on to purchase the fruit that I had gone in there for in the first place, but the only thing on my mind was sinking me teeth into one of those yummy little nests! I got in my car....opened my bag, pulled out one of my nests and then looked at the clock. It was only 9:00am! I thought for a brief moment maybe I should wait until later. Then I said..."no way"! I studied the package for a moment (I did not do this when I was frantically trying to hoard all of these for myself in the store) and realized they had changed them. I didn't see the jelly beans in the picture. "Oh well" I said, I don't like them any way. I usually pulled them off and pitch them in the trash. However, I was beginning to feel a little cheated. How can you have a "nest" without "eggs"? I continued to open my nest and then....the choir of angels I once heard.... suddenly stopped singing! 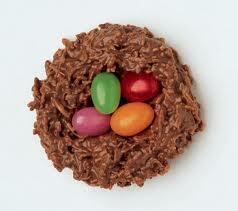 Not only were there no jelly beans aka eggs, but my chocolate nest was more like a hocky puck! What had Russell Stover's done? Well....I did eat the nest, but I have to say, they taste nothing like the old ones! And once being so excited that I had purchased 9 of these....I began to wonder if I could take them back! Thanks for ruining my childhood memory Russell Stover's! If you care even a little about your customers you will ditch the hockey puck and bring back the NEST! Quit trying to be cheap....it's not working! Update: Apparently...I am not the only one that feels this way! According to this link (http://www.facebook.com/#!/group.php?gid=117183871632005) they brought back the old ones....could have fooled me! I wrote to RS on the contact section of their website. We will see if they respond! website and at Russell Stover Retail Stores only. Thank you again for contacting us, and we hope you continue to enjoy our candies. Future purchases can also be made through our Mail Order Department. your purchase of $25.00 or more. This offer applies to online and mail order purchases only. and I don't need $25.00 worth of chocolate so FREE shipping won't do me any good! Thanks for nothing! Can't you just make the originals for everywhere? Really! Here is the after. Now, does the "french" make sense? I was a bad blogger and didn't take pics of the process. Mostly because my batteries were dead in my camera and I wanted to get it finished. I was excited to see the end product. So I will try to explain what I did. If you have questions, you can always email me. I stained the top and the base in Minwax Ebony. The wood is furniture grade yellow pine and it has a lot of natural graining. So the variations in color is were the grain is. I think it kind of looks like zebra wood (which I dearly love and can't afford), but a little more random in pattern. The body, I painted in a creamy white (my own custom mix from a can of stark white paint and some tan paint I had left from another project). I transferred my design using good old fashioned transfer paper and a pencil. I then painted this with basic black acrylic. After that, I dry brushed a miss tint from Lowes in gray over the entire body of the trunk including the design. Once this was dry, I antiqued it with a mix of raw umber acrylic and antiquing glaze and lightly distressed with a palm sander. Then I sealed the whole thing with wax. Got to use the buffer for the first time on this....LOVE that piece of machinery! Please don't ask me what this says....I HAVE NO IDEA....but I liked the look. So....I have done the work for the right person, now it will either find a home rather quickly or it will continue to sit. Hopefully the right person will come along. 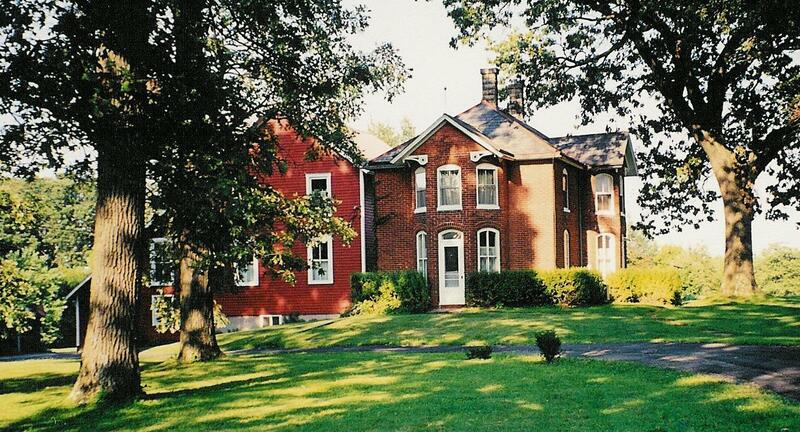 Does this remind you of peaceful days at Grandma's house? Good food, good company and lots of great stories? Along with a lot of really bad decor? Maybe not for you, but I often see things at the thrift shops that remind me of my grandma or things my grandma had in her home. Never been to Strawberry Farm B& B, but it looks really nice. I often find myself saying "Oh my, my grandma used to have this." It was hideously obnoxious in her house, but it brings back really good memories. So there is some part of you, deep down really kind of likes it. Even though you would be completely embarrassed if any one of your friends spotted it in your home. I'll show you how to hide it! Goodwill is about are only option here in Indianapolis or at least around the area I live in. We do have a few others, but not near my house. I have 4 Goodwill Stores within 4 miles of my house, so that seems to be the one I frequent the most. I come across these Flashy Gold Plastic Relics quite frequently (and you guessed it, my grandma used to have them hanging in her house). I snag them up in a heart beat! The people around me must think I have really bad decorating taste, kind of a Liberace inspired design. I assure you that is NOT the case! But I do think they have great detail, a ton of potential and let face it...we are drawn to things that give us that warm, all over fuzzy feeling. Some of my re-purposing is the obvious and some I have really tried to think outside the box. Work with me on this. Gold scrolly taper candle wall decor? Looks like Grandpa's pipe sticking out of some fancy holder, but if you look at what the candle holders are coming out of, it has great detail and is actually quite pretty. Well I removed the candle holder portion (they were screwed in from the back side and very easily removed) and filled the holes with wooden screw caps. You see these a lot on chairs. You can pick up a bag at Michaels, Hobby Lobby or even Lowes for next to nothing. A little glue and some paint! Voila! I found 2 of each of these, 4 total (I think I bought the Goodwill out of gaudy gold). I love, love, love the detail, but hate the gold. They would be great turned upside down and used for a canopy above a bed or you could use them for their intended purpose...flower or plants. That would be great outside on a porch, but what else could be done with these? I decided to turn them into a shelf. First I sprayed the sconce with Rust-oleum plastic spray paint in shell white so I would be sure that the paint would stick. You could stop here and just antique it and it would look great. I wanted it to be a more blue-gray color, so I painted it in some miss tinted gray paint from Lowes that I picked up for $2.00 a quart. Love the miss tints!!! More on paint a little later. My husband cut the boards to the length I wanted and then secured (wood glue and a couple of small nails or brads and let dry over night) a scrap block of wood (you won't see this when it's finished) with one edge of the sanded board leaving about a 1/4 of an inch gap between the block of wood and the edge of the board. This is how you will mount the board to the sconce. Turn the sconce upside down and set it over the block of wood. Drill 3 pilot holes through the back of the sconce into the wood block. Then insert 3 screws. After securing the sconce to the board with the block of wood and screws, you are going to caulk around the front edge of the sconce and the board to fill in any unwanted gaps. Once the caulk is dry (best to let sit over night) it's time to paint. Here is the finished project. This picture does not do it justice. It looks much prettier in person. I am going to blame it on the mustard colored wall. Have I mentioned that I really hate them? Oh well, no use in complaining, there is nothing I can do about them. That's the color the booth came with and I can't change it! This one I painted for the booth. I think the next one will be for my master bedroom. Sorry Grandma...the gold is gone! Ciao for now! More later!